Avril Lavigne and Chad Kroeger are celebrating one year of marriage, or rather have celebrated one year of marriage now. The world took a step back over a year ago when Avril stepped out sporting an engagement rock that most expected would require two armed guards at all times. It was 14 carats. Surely such a ring can't be topped, only it was, folks. To celebrate one year of marriage, Chad Kroeger bought his bride an upgrade. 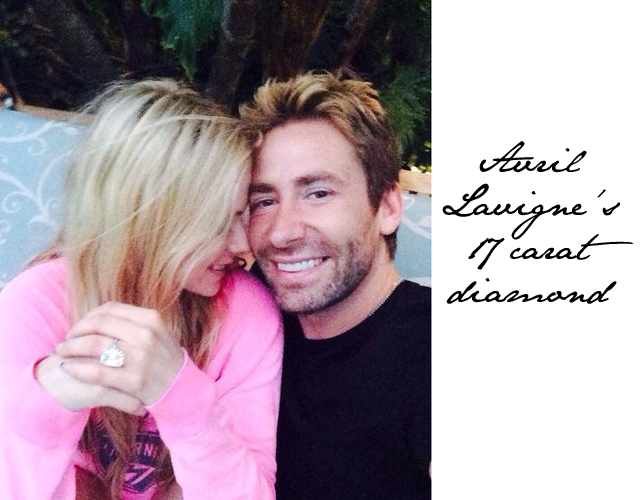 Avril Lavigne is now supporting a 17 carat ring on her wedding finger. I say supporting as the boulder on her finger looks as if it may need some serious attention for lifting. Yikers. Avril shared the snap seen above on her twitter account last night stating, "I still can't believe my 1 year anniversary gift. 17 carat emerald cut. Wow. I love my hubby."